Well time marches on relentlessly and this is now my 5th end of year review. Over this period, some things have changed - at the start, I did not hold Vanguard Lifestrategy - today it is by far my largest holding. Some other things remain the same - I still hold many of the original investment trusts - Aberforth Smaller Companies, City of London trust, Temple Bar and Edinburgh. As ever, an interesting year on the markets and even more so politically. The decision to go ahead with Brexit was triggered in March and, as it stands, we are on course to leave the EU in 15 months time. In June we had a snap general election designed to strengthen the PMs negotiating position but which backfired leaving the Government without a majority in the Commons and needing the support of the DUP. Thankfully we managed to get past phase 1 and can now start negotiations on a transition period and trade deal...I have a feeling this will be very tricky but remain hopeful that we get a good outcome in readiness for leaving the EU next March. Meanwhile, President Trump is coming up to celebrating his first year in charge and hardly a day has passed without him hitting the headlines...'fake news' entered the OED! Despite the political uncertainties, the markets seem to have sailed through all these events without missing a beat, which I did not expect at the start of 2017 and which just reminds me how difficult (and unwise) it is to try and second-guess the markets. 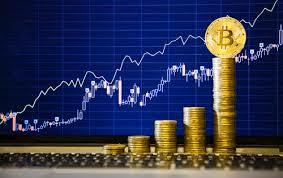 By the way, did anyone invest in Bitcoins at the start of the year? If so, I believe you will have done well as the price has gone up from $1,000 to currently $14,000... it was $19,000 just before Xmas. To be honest, I really do not understand this whole area of finance but I will be looking to learn more about this blockchain revolution over the coming year as I suspect it may become a significant advance to the way our financial systems operate. It will be interesting to see how the various cryptocurrencies - Bitcoin, Litecoin, Ethereum, Ripple, Dash etc. 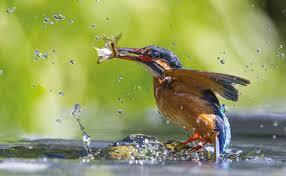 evolve and become more established as alternatives to the way we have traditionally done business. Recently, Vanguard announced it will looking at using blockchain to simplify and automate the process of sharing index data. They said its blockchain will enable index data to move instantly between index providers and market participants and should result in a cost saving which they can pass on to their customers. On a personal level I experienced my own WTF episode in March when my computer hard drive crashed. I thought I had a back up disc but turned out I had not done the backup procedure correctly so lost all my files! It has taken some time to reconstruct documents and spreadsheets on my replacement laptop but some of my research material is locked away on my old HD. Also, in January, I published my books in paperback format. It seems to have been a popular addition and sales of the paperbacks are roughly double that of the ebooks, which in turn have seen an increase in sales. As the books were already written, all that was required was a little updating and then an upload to Kindle's paperback version. On the downside, Amazon take 40% of the sales (30% for ebook) and also there are print costs deducted so the cover price has to be higher to provide a similar net income. The most popular book is 'DIY Pensions' which accounts for over 60% of sales...it's encouraging to know there are lots of people out there getting to grips with personal finance and saving for the future. So, moving on to investments. In 2015 I decided to review my whole investing strategy. The outcome was to begin to simplify and diversify - wind down my individual shares portfolio and reduce some of my managed funds. The proceeds were diverted towards an increasingly passive strategy - in particular, using the Vanguard LifeStrategy index funds. 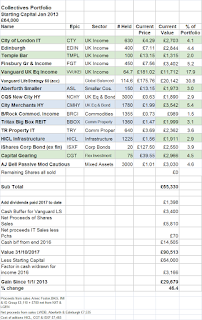 Over the past year, I have completed the sale of all individual share holdings and a couple of investment trusts which did not seem to be contributing much to the basket. I have also started to operate a more flexible approach to taking income from my investments which involves the sale of capital units from my VLS funds. Turning to my portfolios and following on from my half-year review at the end of June, I have just completed a review of my actual investment portfolios - sipp flexi drawdown and ISAs - for the full year to the end of December. The FTSE 100 started 2017 at 7,142 - and has steadily progressed to finish the year up 546 points closing at an all time high of 7,688 or 7.6% - if we add on say a further 3.8% for dividends paid, this will give a ballpark total return figure of 11.4% for the full year. 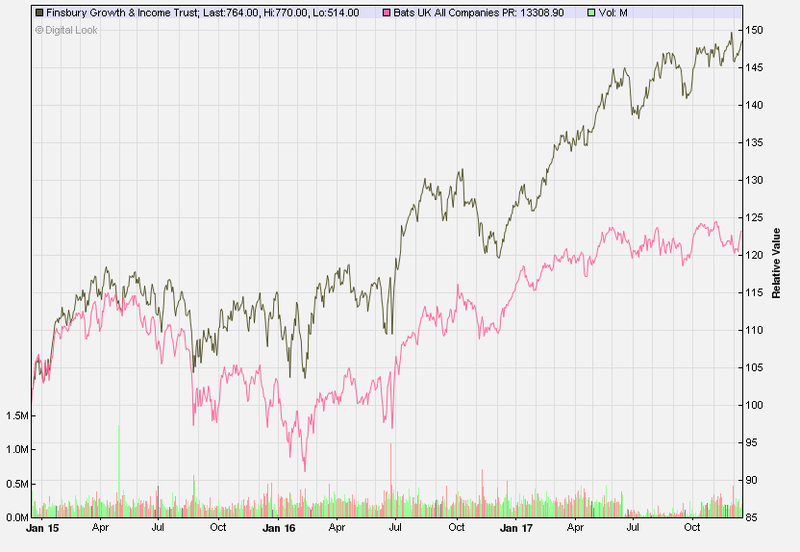 The second line FTSE 250 has done better and the FTSE All Share index is up 13.0% for the year. My Vanguard Lifestrategy funds are a diverse mix of global equities and bonds and provide a good benchmark for a balanced global portfolio. The 60 & 40 funds are up 8.6% and 6.5% over the past year. So far as cash deposits go, returns must surely be the lowest in a generation however there is a little ray of hope for savers. In October the Bank rate increased for the first time in a decade from a record low of 0.25% back to 0.50% with the prospect of a couple more increases in the new year. The savings rate on my instant access account with the Coventry BS has increased by 0.25% to 1.40%. This may not seem much but the interest I will receive increases by over 20%. 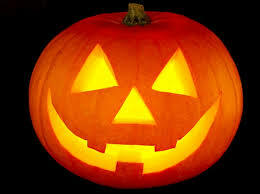 However, inflation is creeping up - currently 3.1% so it's still really tough for cash savers to keep ahead of the game! As mentioned last year, my individual shares portfolio has been the main area of change following my review of strategy and I have recently completed the sale of all remaining shares - Unilever, Amec Foster, Legal & General, IG Group, Berkeley Homes, IMI and Next. The total return including income on my individual shares has been just over 20% which makes up for the disappointing returns of just 1.5% in 2016. Some of the proceeds have been recycled into Capital Gearing and AJ Bell Passive with a view to preserving gains made in recent years. The rest of the proceeds remain in cash awaiting better opportunities down the line. Over the 12 month period, I purchased a holding in Scottish Mortgage for my SIPP from the sale of Invesco Income Growth. I have also added HICL Infrastructure. In my ISA, I disposed of Dunedin Income Trust which was replaced with the more defensive Capital Gearing. The better returns came from Finsbury Growth & Income (again) up 22%, new addition TR Property up 36%, Scottish Mortgage +31% and smaller companies specialist Aberforth up 24%. The only trusts that has struggled for me this past year have been Blackrock Commodities Income -9% and new addition HICL Infrastructure which I hold in both ISA and SIPP. The total return for my basket of trusts over the year was a respectable 10.8%. Income yield from the trusts portfolio has been steady at 3.6%. Over the past year I have added VLS 40 to my SIPP flexi-drawdown, also iShares Corp. 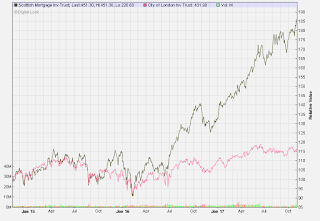 Bond fund (replacing Law Debenture) and AJ Bell Passive fund and most recently, Kames Diversified Income to my ISA. Finally, a significant percentage of my redistribution of shares and active funds have been invested in the two Vanguard LS index funds - 60 and now 40 added. The intention is to sell down units each year to provide ‘income’ and I have also set aside a cash buffer reserve representing 10% of the funds value from which I can draw upon for income in bear market years when returns on the index fund are negative. Last year, the LS 60 fund advanced by 18.6% so I took the opportunity to draw the equivalent of 2 yrs income by selling 8% of my units. My Vanguard UK Income fund provided a nice uplift in dividend this year - up 82p or 10.5% compared to 2016 which is probably due to the fall in sterling and is not likely to be repeated next year. The contribution from my index collectives has therefore been positive over the year with a total return of 8.4%. As ever, the fixed interest sector has provided a steady and predictable income of 5.8% plus capital appreciation of 6.5% providing a total return of 12.25% for the year. The better returns came from my two investment trust holdings - New City +12.5% and City Merchants +10% and also my Lloyds Bank Pref Shares chipped in a nice 29%. My last remaining PIBS with the Skipton BS were redeemed in April 2017 and I have used the proceeds to add HICL Infrastructure Trust and also iShares Corp Bond (ex financials) ETF (ISXF) to my income portfolio. A sum of £1,000 at the start of 2011 has now grown to £1,700 and an average annualised return over 7 years of 7.9%. This has enabled me to take my 4% annual income leaving some held back to build reserves. I am hopeful of continuing to withdraw this level of income for the foreseeable future but as my state pension will be due this coming year I will not be so reliant upon the investment income. As the shares are sold down there seems less to report on and therefore the number of posts has reduced. In these times of low interest rates and corresponding low returns from cash deposits, for just a little more risk, an average annualised return of almost 8% over the past few years is for me very acceptable. Return on my investments have been positive in 7 of the past 8 years and I am thinking the wheel may be about to turn! However, I have no special insight and I would not be surprised to see the bull keep running. Over the past year I have lost out by reducing my equities and moving to cash and defensives. However, it's difficult to put a price on peace of mind and I am starting to feel more comfortable with my revised strategy - removing the individual shares means less monitoring of dividend receipts, annual reports etc. The move to index funds provides more global diversity and in particular the equity/bond balance provided by the LS funds provides less volatility and more stability. One bonus from the changes means it easier to leave the portfolios alone and therefore avoid tinkering. I am reducing equities and gravitating towards an allocation which I hope will continue to provide a reasonable level of return which keeps ahead of inflation without too much volatility. I remain mindful of the words of Ben Graham 'The investors chief problem...even his worst enemy...is likely to be himself'. I subscribe to the philosophy - it seems to me the easiest way to grow wealthier is learning to live with less, because living with less has a higher success rate than attempting to make a fortune, and fortunes tend to push aspirations and desires higher anyway. Finally, thanks to all for dropping by during the past year and wishing everyone all good things for 2018. As always, if you keep track of portfolio returns, feel free to leave a comment and share with others how you have fared over the past year. I have held FGT in my ISA for the past 6 years. It continues to deliver year after year and remains one of the top UK Income Trust in terms of net asset value and share price performance over five and ten years, its returns far outstripping those of the FTSE All-Share index. A sum of £1,000 invested 10 yrs ago would now be worth £3,052 compared to a total return of £1,752 from the benchmark FTSE All Share index. He holds shares for the long term regardless of short-term volatility, aiming for them to double or more in value over time. This results in extremely low portfolio turnover, which saves on transaction costs. The trust's total expense ratio remains reasonably low at around 0.7%. The trust has this week announced results for the full year to 30th Sept 2017 (link via Investegate). 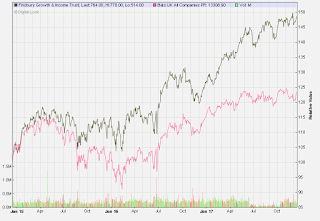 The trust has outperformed the all share index in each of the past 5 years and once again, this year is no exception. 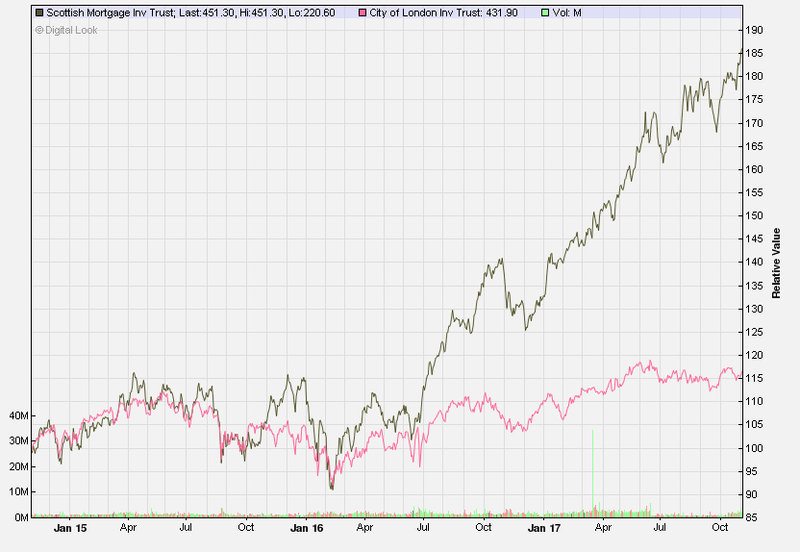 Share price total return is 14.2% compared to 11.9% return for the FTSE All Share. Top five portfolio holdings are: Unilever 10.1%, Diageo 10.0%, Relx 9.3%, London Stock Exchange 8.6% and Hargreaves Lansdown 7.0%. Over the past year the dividend has increased by a respectable 8.4% to 14.2p (2016 13.1p). Revenues were 15.8p (2016 15.2p) and therefore there is a surplus after accounting for payments of dividends which will further bolster the dividend reserves. It is worth noting that Nick Train has made a significant addition to his personal share holding and now holds 1.2m shares in the Company which represents the whole of his personal investment in UK equity and is a significant portion of his total assets. 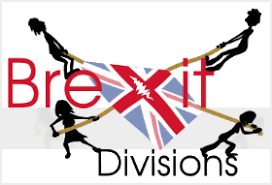 Commenting on the results, manager Train said "We know that currently some shareholders worry about Brexit and other macro-economic or political issues, but we continue to believe that the most rational way to respond to these concerns is to work on the following assumption. “Everything will work out just fine in the end.” This may read as complacency, but the truth is that ever since the FT All Share was first calculated, back in 1962, there has always been something to worry about. The index had a base value of 100 in 1962 and now stands at 4130 – that’s a 7% pa compound return, excluding dividends. Those returns, earned from the compounding profits of well-run UK companies, have accrued despite dramatic political, economic and social changes. We think it sensible to assume steady wealth creation will continue. And this is why I have continued to add to my own holding in Finsbury throughout 2017". The shares are currently trading at 760p and I have recently reduced my holding by 20% to provide a little more 'income' from the capital appreciation over recent years. 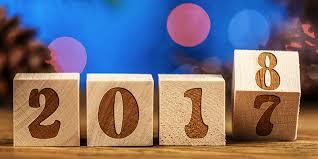 I am happy to continue holding the remainder for the coming year and beyond. "There can be little doubt than many ordinary people struggle to deal with issues of personal finance and particularly such matters as pensions and equity investments. On the few occasions I discuss these issues with friends and relations it seems the subject matter quickly moves on to less challenging topics. 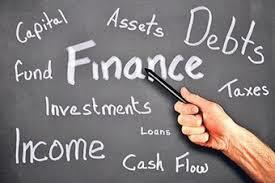 However, just because personal finance is not widely discussed or understood, does not mean it is not important". In March 2014 two American economists, Annemarie Lusardi and Olivia Mitchell published their research (pdf) on the subject of financial literacy. They conducted a 3 question survey to see how much respondents understood interest, inflation and investment risk. Suppose you have $100 in a savings account and the interest rate was 2% per year. After five years, how much do you think you would have in the account if you left the money to grow? Do you think the following statement is true or false: Buying a single company stock usually provides a safer return than a stock mutual fund? This was a global survey and the results revealed a surprising level of financial illiteracy all around the world. Only 3 out of 10 people answered all three questions correctly in the US. In Europe, the best performing respondents were the Germans (53% got a perfect score) and the Swiss (50%), but this still leaves almost half of each country’s population without a basic understanding of very basic financial matters. In countries with relatively strong economies, the numbers are sobering: 79% of Swedes, 75% of Italians, 73% of Japanese, and 69% of French could not respond correctly to all three questions. The score for Russia was a 96% fail rate! Unfortunately the study does not provide results for the UK. Whilst men outperformed women on the finance quiz, greater numbers of women responded that they “don’t know,” a result that held true all over the world. The upshot is that women, more conscious of their limitations, are more likely to be interested in financial-education programs. This lack of education appears to be taking a toll - half of all Americans have nothing saved for retirement, just one third of all adults in the U.S. have only several hundred dollars in a savings account and 61% report that they don't have sufficient rainy day savings to cover six months' worth of essential expenses. Interesting but Does It Matter? Financial literacy involves the ability to make informed decisions which are integral to our everyday lives - how a bank account works, how to save, how a mortgage works and how to avoid debt. People who lack the basic ability to negotiate the basic financial landscape will be at much higher risk of falling prey to the unscrupulous system which snares the unwary into a spiral of unsuitable financial transactions and which result in high levels of unaffordable debt. People with low levels of financial literacy are likely to borrow more on credit, and tend to pay off the minimum each month. They are unlikely to save let alone invest and will have little or no provision by way of pension for retirement. This is increasingly what we are seeing not just here but in all parts of the world. In a study undertaken by the OECD in 2016 (pdf). Financial knowledge is an important component of financial literacy for individuals, to help them compare financial products and services and make appropriate, well-informed financial decisions. A basic knowledge of financial concepts, and the ability to apply numeracy skills in a financial context, ensures that consumers can act autonomously to manage their financial matters and react to news and events that may have implications for their financial well-being. The literature indicates that higher levels of financial knowledge are associated with positive outcomes, such as stock market participation and planning for retirement, as well as a reduction in negative outcomes such as debt accumulation. Thirty countries and economies, including 17 OECD countries, participated in this international survey of financial literacy; In total, 51,650 adults aged 18 to 79 were interviewed using the same core questions. The UK came 15th overall, just ahead of Thailand and Albania and below the average for all countries in the study. The average score across all participating countries is just 13.2 out of a possible 21 (a combination of a maximum of 7 for knowledge, 9 for behaviour and 5 for attitudes), and 13.7 across participating OECD countries, showing significant room for improvement. Fewer than one in two achieved such a score in 11 of the participating countries (South Africa, Malaysia, British Virgin Islands, Belarus, Thailand, Albania, Russian Federation, Croatia, Jordan, United Kingdom and Brazil). However, in stark contrast, over four out of every five (84%) adults in Hong Kong, China achieved the minimum target score. Across all participating countries and economies, two in five respondents had not saved in the last 12 months. The weakest areas of financial behaviour across these measures appear to be related to budgeting, planning ahead, choosing products and using independent advice. Interestingly, relatively few people are choosing new financial products with the aid of independent information or advice – including best buy tables – indicating that more could be done to guide consumers towards unbiased sources of information. People may also need education and guidance to identify realistic alternatives to borrowing when income is insufficient to make ends meet. Education that applies behavioural insights, such as encouraging people to set goals and commit to them, could also help people to behave in more financially literate ways, including active savings behaviour and longer-term planning. Maybe it's not such a big problem if most of us cannot work out the better value between a 4 pack and nine pack of loo rolls in the supermarket. Some people who are not so good with finances will be good at other aspects of life and can get by with a little help from their partner or friends. However it matters a lot if people are conned out of life savings because they lacked a basic understanding of how the system works, or end up borrowing more than they can afford to pay back because they cannot understand APR, or opted out of a workplace pension because some guy down the pub gave them dodgy advice. 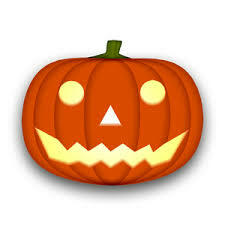 This year, personal consumer credit lending passed £200 billion in the UK. I have been writing this blog for close on five years and I have written and self-published four books. I suspect that, whilst aiming to reach a broad audience of would-be investors, in reality I am just scratching the surface or finding a small audience of readers who are already well versed in the dark arts of personal finance. There may well be a very large section of the general public, probably well over 50% who cannot understand simple personal finances and therefore cannot access the basic information. They may never be in a position to implement a savings plan or monitor their income and expenses let alone set up a basic DIY investment portfolio. Leave a comment below if you have any thoughts on the state of financial literacy. The Chancellor's credibility was severely dented after his first budget in March when he had to backtrack on national insurance rises for the self employed which were at odds with a manifesto pledge not to increase NIC levels. Shortly afterwards, the PM called a snap election which failed to deliver the increased majority and left the Government without a majority and now relying on the DUP. Added to this is the well-documented Tory in-fighting over Brexit which is creating a very unsettled feel at the top table. 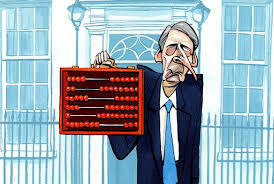 Against this difficult backdrop, Hammond has to balance the books and continue the efforts to reduce the borrowing deficit whilst trying to counter the allure of Labour's borrow & spend strategy which seemed to be popular at the general election, particularly with the younger voters. Our borrowing is still not under control. Net PSBR now stands at £1.8 trillion which is almost 4x the figure for 2007 (~£500bn). Admitedly the annual deficit has been gradually coming down year on year since 2009 when we borrowed £152bn but the fact remains we continue to borrow each year - estimates for this year are £60bn. Last month alone, the government paid £6m in debt interest - the highest amount for a single month on record. The more we borrow, the more we pay in interest which is linked to inflation rates and this means less to spend on welfare and essential public services, housing and infrastructure. At some point we have to grasp the nettle and start to live within our means. Unfortunately, the chancellor's scope for big changes has been curtailed by the OBRs forecast for productivity and growth. Whilst employment has risen to near record levels in the UK , productivity growth has averaged just 0.1% since 2008, compared to 2.1% in the previous decade. The OBR has revised down its forecast for GDP growth in 2017 to 1.5%. The OBR forecast debt will peak at 86.5 % of GDP in 2017-18 the highest it has been in 50 years. On Brexit, the government have set aside a further £3bn of new money to prepare for the possibility of a 'no deal' which looks to be a prudent provision given the way negotiations are shaping up. The starting rate for savings income that is subject to the 0% starting rate will be kept at its current level of £5,000 for 2018-19. After a big jump last year, the ISA limit for 2018-19 will remain unchanged at £20,000. The annual subscription limit for Junior ISAs and Child Trust Funds for 2018-19 will be uprated in line with CPI to £4,260. The lifetime allowance for pension savings will increase in line with CPI, rising to £1,030,000 for 2018-19. From next April, personal allowances will increase from £11,500 to £11,850 (up 3% in line with inflation) and HR tax allowance up to £46,350. As widely forecast, there was a focus on the housing situation. There was an extra £15bn of new money bringing the total to £44bn over the next 5 years combined with a reform of planning laws to free up available land for more houses. The target is for 300,000 new homes per year by the mid 2020s. In addition stamp duty has been abolished for first time buyers of properties up to £300,000. So, likely to push up prices - particularly in London and the SE, which will make buying a house even more unaffordable. Of course there are many other provisions in the budget - help for those on Universal Credit, an increase in the national living wage, more money for the NHS etc. but notably there is nothing on the thorny issue of funding for long-term care which became a big issue at the last election. 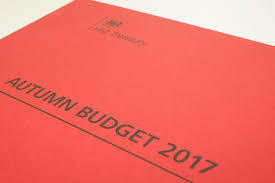 Here's the Budget from HM Treasury in full. The chancellor has been under pressure from many quarters in recent months and the relationship with the PM is strained. I suspect he has bought himself a little more time with this relatively 'safe' budget...time will tell. It joined my SIPP portfolio at the start of the year at my initial purchase price of 338p. The share price has advanced 35% over the year to currently 457p which is naturally very pleasing. The trust has today issued results for the halfyear to end September 2017 (link via Investegate). Share price total return is up 15.4% compared to 1% for the benchmark FTSE All-World index. Scottish Mortgage has increased total net assets to more than £6 bn making it one of the UK's largest investment trusts. It was promoted earlier this year to become the only investment trust in the FTSE 100 which provided a boost to the share price as it now has to be held by all the FTSE 100 index funds. The managers, James Anderson and Tom Slater run a conviction portfolio of around 75 shares. The result is a portfolio dominated by big holdings in some of the companies involved in the new world of social media, the internet, healthcare, eco-friendly energy and gene therapy. The top ten holdings account for 49% of the portfolio and include Amazon 7.7%, Baidu 5.4% (China's equivalent of Google), Alibaba 6.8%, Facebook 4.7%, Tesla Motors 6.8% and Alphabet (Google) 4.2%. 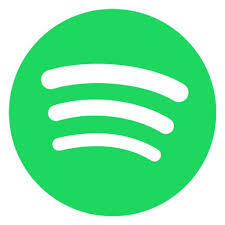 Some 13% of the portfolio is invested in unquoted companies - online music provider Spotify, Dropbox, peer-to-peer lender Funding Circle and airbnb to name a few I am familiar with. “These are truly global businesses, significantly impacting their large publicly-listed competitors, but as yet they remain private companies,” said the statement. Largest holding Amazon has become a giant in global retail. Over just 10 years it has grown more than 25-fold from a market cap of $20bn to currently over $500bn. Over the past ten years, the trust has delivered a return of 300% (second only to Linsell Train). Although this is essentially a global growth trust, it is worth noting it has increased its dividend every year for the past 33 years. Whereas the likes of my UK income trusts such as City of London provide a steady 4% or so natural yield, I am hoping to take my required 'income' from the sale of shares at some opportune future point. Were I to sell today, the profit from the appreciation in the share price since purchase would provide my 4% 'income' for the next 9 years. Obviously I am pleased with progress since my purchase and hope to add to my initial holding when there is the inevitable pull-back down the line but for now the current holding will return to the bottom drawer. There have been a couple of changes to the portfolio since my last update earlier in the year so I will take this opportunity to bring things up to date. As the markets have continued hitting new highs in recent weeks, I have taken the opportunity to sell down the two remaining individual shares. Retailer NXT has had a bumpy ride over the past year or so, falling from a high point of £80 per share and recently down to below £40 so a sale of 30 Next @ £51.25 and secondly a sale of 800 Legal & General @ 273p. 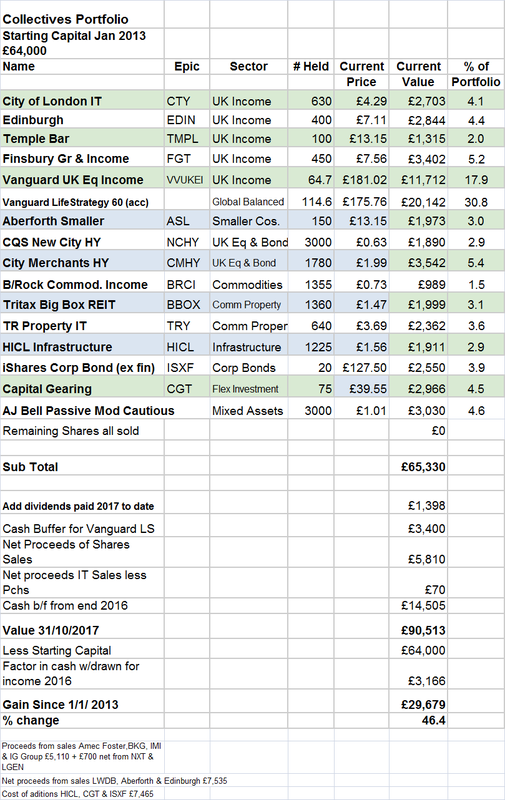 The net proceeds for the two holdings was £3,702 and most of this - £3,000 - has been recycled into a new addition of AJ Bell's Passive fund which I mentioned a while back - I settled on the moderately cautious version for the time being. My demonstration portfolio has now been running for almost 5 years. There have been a few more changes than I would ideally like however some of the investment trusts have been there from the start - City of London, Aberforth, Edinburgh etc. The main development over the past couple of years has been the introduction of the passive Vanguard funds and the decision to abandon the individual higher yield shares. The portfolio has been steadily on the rise over the whole year to-date. So, how have the various investments fared and are my investment trusts adding additional value compared against my Vanguard trackers? The only investments to have lost ground in 2017 is Blackrock Commodities - currently down ~10%, however it is the smallest holding by value and also, as it gained 69% last year, I am not too troubled. Edinburgh Trust has remained fairly flat and I suspect has been affected by a holding in Provident Financial which hit the buffers last month. Leading the pack are smaller companies specialist Aberforth with a gain of 24%, Finsbury 19% and new addition TR Property 26%. Most of the others have reached double figures which is good. There has therefore been a little more progress over the year. The value of the combined portfolios at the start of 2017 was £85,398 compared to the current value of £93,679 - a rise of £8,281 and total return of 9.7% year to date. The total return for the FTSE All Share index is also 9.7%. There is still currently a large percentage of cash sitting on the sidelines. Some is from recent shares sales and some from a top slice of my Lifestrategy fund last October. One of the reasons for turning to the addition of Capital Gearing and the recent AJ Bell funds was my concern about the high valuation of equities. The US markets have seen the second longest 'bull' run since 1945 and the CAPE ratio is over 30 compared to the long term average of 16.8. In addition, the slump in sterling post Brexit - currently $1.32 - still makes global investments relatively less attractive so I will stay in cash for a little while longer.